Bad smelling toilets give the impression of an unhygienic, improperly maintained restroom. Impact Hygiene offers a range of smart air freshener dispensers to suit the needs of any establishment. Our air freshening technology works to continuously permeate your restroom with quality fragrance leaving your restrooms smelling fresh day after day. Select from basic dispensers that a meet a budget, medium range or chic, slimline dispensers for premium venues. For a neater and more uniform presentation, air freshener dispensers of your choice can be coordinated with other required dispensers for your restroom, i.e. soap, toilet tissue and hand towel. Dispensers can be fitted with your choice of fragrance from our extensive selection. 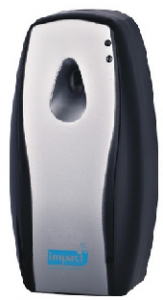 Impact Hygiene’s air freshener dispensers can be purchased at competitive rates or you can opt for a service contract. These are monitored and regularly replenished by our service technicians. With over 19 years experience in corporate washroom hygiene services and a dedicated friendly team, at Impact Hygiene, we deliver exactly what you need! We’re flexible and family owned, we can tailor a program to suit your needs. Thank you for the fantastic job you are doing with our service! After an Impact Clean our toilets are finally shiny, clean and odour free. Thank you Impact ! Great service, very efficient and professional. We’re very happy with the standard of your company and service. Hi Travis, I am really pleased with the way the restrooms have come up after cleaning. I would be happy to recommend you to any store. I have passed this feedback onto my colleagues. Thank you ! Can you please pass on my appreciation to the technician who serviced our site last week, she was wonderful, it was actually refreshing to see someone who has it all – service with a smile, great personality, great customer service, fantastic at her job, she was very well presented, what a great representative of your company.